Setup and deploy in minutes! DDoS attacks have become the weapon of choice for hackers, criminals, and political cyberterrorists. They are inexpensive to perform and difficult to stop. For $50, a malicious user can rent a botnet to launch a 24-hour long attack on any Website of their choosing. DDoS attacks are also more sophisticated than ever; advanced attacks now evade firewall detection by targeting application resources and vulnerabilities. To demonstrate how pervasive DDoS attacks are, 74% of organizations sustained at least one DDoS attack during a 12 month period, according to Forrester Research. Imperva Cloud DDoS Protection, powered by Incapsula, offers a complete defense against all types of DDoS threats, including network-based attacks, like SYN or UDP floods, and application attacks that attempt to overwhelm server resources. The service also blocks advanced attacks that exploit application and Web server vulnerabilities, like Slowloris, and it caches content to ensure optimum performance, even when under attack. Unique bot-detection technology improves security accuracy by differentiating real users from automated clients. The Imperva Cloud DDoS Protection Service scales on demand to stop multi-gigabit denial of service attacks. With Cloud DDoS Protection, customers can be assured that their applications are accessible without needing to over-provision expensive Internet bandwidth. Application downtime for revenue generating Websites costs businesses thousands or even millions of dollars per hour. Application outages can also affect customer loyalty and impact company reputation. For Web-based businesses, DDoS attacks that last several weeks or months could even affect company viability. Cloud DDoS Protection prevents the brand damage and lost revenue associated with a devastating denial of service attack by quickly and accurately blocking attack traffic. Cloud DDoS Protection can be rolled out without any hardware, software or Web application code changes. Customers can provision the Imperva Cloud DDoS Protection Service simply by changing their Website’s DNS setting. This effortless deployment allows customers to be protected in a matter of minutes while maintaining their existing hosting provider and application infrastructure. The Imperva Security Operations Center (SOC) protects Web applications using collective knowledge about DDoS threats, including new and emerging attack methods. The Imperva SOC aggregates information across the entire service network to identify new attacks as they happen and to detect known malicious users. Based on this aggregated information, mitigation rules can be applied in real-time across all protected Websites. Cloud DDoS Protection provides organizations with continuous monitoring by knowledgeable and adept Security Operations Center (SOC) engineers. With Cloud DDoS Protection, organizations can leverage a dedicated team of DDoS security professionals. Payment Card Industry Data Security Standard (PCI DSS) requires that you must either install a Web Application Firewall or review all Web applications annually and after all application changes. Imperva Cloud WAF helps you maintain PCI DSS section 6.6 compliance in an affordable way. With Imperva Cloud WAF, you get continuous protection that does not impact Web development processes and does not result in burdensome consulting costs. Every day, many legitimate websites are added to the malware blacklists of security software firms, search engines, and browser makers due to application vulnerabilities. As a result, customers and partners may find their access to your website blocked and your business effectively shut down. Imperva Cloud WAF enables you to close vulnerability gaps in your applications to avoid blacklisting and ensure your website is always accessible. Having an online presence is critical for businesses today. The challenge is that hackers often prey on smaller organizations, accumulating their gains into a profitable cyber crime business. Imperva Cloud WAF protects websites and online applications against current and emerging threats, including SQL Injection, Cross-site Scripting (XSS), illegal resource access, malicious bots, and other OWASP Top 10 threats. Security experts behind the Imperva Cloud WAF managed service ensure optimum protection against newly discovered vulnerabilities to prevent disruption to your Website. Imperva Cloud WAF accelerates the performance of your web applications, which results in faster web page load times, reduced web server workload, and lower website bandwidth consumption, all without compromising your website’s functionality. 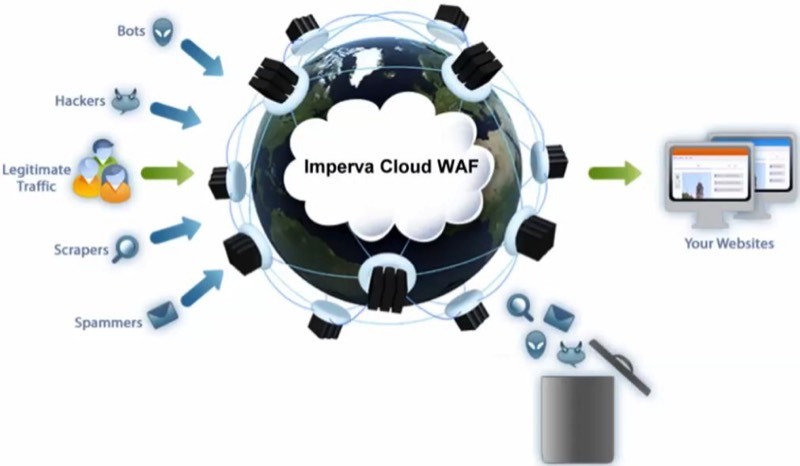 Imperva Cloud WAF also monitors every web transaction to ensure optimal performance and identifies website errors, slow loading pages and other performance issues and automatically alerts you so you can correct the issue and minimize downtime. Imperva Cloud WAF does not require any hardware, software or changes to existing web application code. Imperva Cloud WAF is provisioned as a service via a simple change to your website’s DNS setting. This effortless deployment enables organizations to jumpstart their Web application security initiative while maintaining their existing hosting provider and infrastructure. Imperva Cloud WAF protects your web site with collective knowledge about threats, including new emerging threats. Threat information is aggregated across the entire service network and used to identify new attacks as they happen and simultaneously apply mitigation rules to all websites protected by Imperva Cloud WAF. While every organization wants their website protected against threats, not every business is able to dedicate the resources required to deploy and manage enterprise-class web application security. By leveraging a software-as-a-service (SaaS) delivery model, Imperva Cloud WAF provides businesses with the highest levels of website security without requiring a large resource investment. Imperva Cloud WAF couples effortless deployment and dedicated security expertise with low annual costs to significantly reduce your capital expenditures and operational costs. SecureSphere File Security products protect sensitive file data stored on file servers and network attached storage devices. SecureSphere provides full visibility into data ownership, usage and access rights and enables executives, auditors, security and IT managers to improve data security and meet compliance mandates. •	SecureSphere File Security products are part of the SecureSphere Data Security Suite (DSS). DSS extends end-to-end protection to web applications, databases and files.